"A Brighter Tomorrow" (23" x 18") was prepared for the HOPE Exhibit in the lobby of the Forrest General Hospital Cancer Center in Hattiesburg, MS, Aug. 20-Sept. 7. 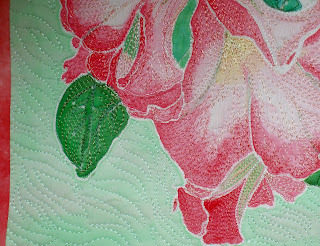 The exhibit contains 30 pieces of artwork by the South Mississippi Art Association and is sponsored by Spirit of Women, SMAA, and Waiting for a Cure. The piece features reverse applique, AngelinaTM fibers, organza, with an overlay of tulle. 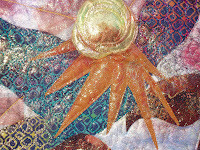 The bright sun is made of Fantasy FilmTM (http://www.artglitter.com/). 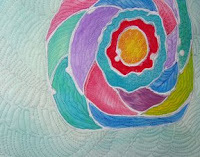 Various colors of rayon and polyester thread were used for the quilting, and the white border was quilted by bobbin drawing, using Madeira Glamour thread. This piece, entitled "Color My World (18" x 17"), was painted with Jacquard textile paints, using melted paraffin and beeswax for resist on white Kona cotton. The four borders are hand-dyes, and the inner borders of print in a swirling, rotating fashion were added to carry out the feeling of circular movement. The binding strips also rotate clockwise. Here is the second painting, also using a resist. With this much detail and the objects being rather small, I decided to frame it (11 x 14) under glass. There is no stitching on this one. 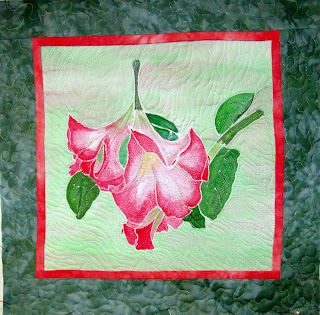 I used Jacquard paints on white silk to create this Angel Trumpet based on a photograph of this beautiful flower in my yard. The borders are hand-dyed Kona cotton. 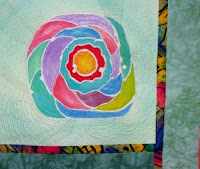 The machine quilting was done with rayon thread. 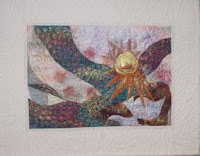 As a fiber artist, I love to create using fabric, threads, layers, appliques, and embellishments. 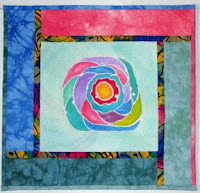 This blog will enable me to post pictures and text of what I am working on. I hope friends will check in often and let me hear from you.